A photograph is a most important document, and there is nothing more damning to go down to posterity than a silly, foolish smile caught and fixed forever. More than that, it seems to me that 19th century people were more emotionally unguarded when being photographed. Maybe the technology was still so new that they hadn’t yet figured out who they were supposed to be when standing in front of a camera. The original antique photos in my artwork come from a variety of sources, including public domain digital images available online, and pictures from my own private collection. Original images date from the beginning of photography in the 1840s through the World War I era, and span a variety of the early photographic technologies, including ambrotypes, tintypes, cartes de visite, cabinet photos, glass negatives, stereoviews, and real photo postcards. 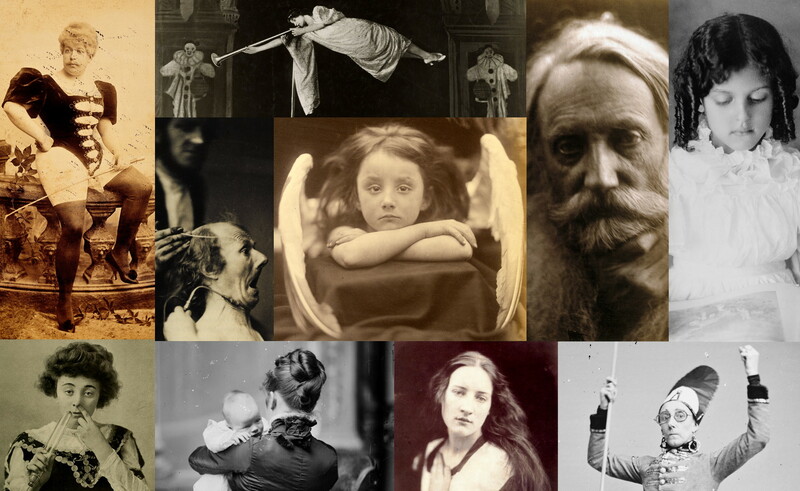 Most photographers whose work I feature, and their subjects, are long ago forgotten, but I also repurpose images from some of the greats of the 19th century, including Julia Margaret Cameron and Matthew Brady. For those who are interested, read on for some of the sources of these images. The Library of Congress has some excellent images in their Prints and Photographs Catalog, if you are willing to wade through a mountain of photos that have oodles of historical value, but often not much artistic interest. Google Art Project has some interesting and very high resolution images of early photography, if you are willing to hunt. Wikimedia Commons features the Google Art Project images in easily searchable and downloadable format, plus many more images of varying scan quality. There are some excellent images by Julia Margaret Cameron here. Flickr’s The Commons is another good searchable resource. The Public Domain Review features articles and links highlighting particularly interesting public domain works, including photos, manuscripts, music and movies. For those with a yen to build their own collection of antique photography originals, there is a world of dealers eager to meet you. But like many antique dealers, they tend not to be terribly technically savvy, and their websites usually don’t offer more than tiny images of the photos for sale. One exception is Dennis Waters and his family, who specialize in daguerreotypes, beautifully scanned, and with a regularly rotating selection. Don’t miss the Antechamber, featuring a variety of non-dageurreotype antique photos for affordable prices, curated by daughter Erin. Medhurst & Co. have a decent website and a range of prices. 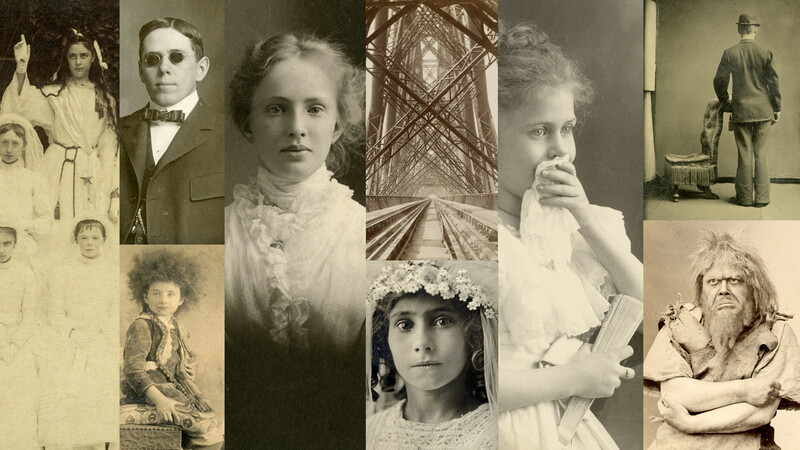 Another good website with some affordable items is Jeffrey Kraus Antique Photographics. The Macrafly online gallery tends to be more pricey but gives a good overview of the different categories of pre-World War I photography types. No listing of online early photography sources would be complete without mentioning eBay. The relevant category is Photographic Images, Vintage & Antique (Pre-1940). I wish they designated an earlier year cutoff, since there is a world of difference between pre-1900 photography and what followed in the next four decades, but there are further subcategories that let you fine-tune what you are looking for. The sheer volume of antique photographs available from eBay on any given day is staggering; as I write this, there are 41,444 items for sale in the Cabinet Photos subcategory alone. You will find some of the best deals on eBay, as long as the picture you are bidding on isn’t in one of the categories that is hot with collectors – Civil War, Native Americans, circus freaks, and post-mortems, to name a few. Daguerreotypes and to a lesser extent ambrotypes tend to go for a lot more due to their antiquity and relative scarcity. There are also antique photo shows for collectors, but if the one I attended is any example, you may be better off shopping online. Pictures are jammed into boxes and you flip through them one at a time while crammed cheek to jowl with other collectors in a hotel banquet room. Personally, I find it easier to view an array of thumbnail images on a screen. Plus, with digital images you have the advantage of enlarging or otherwise enhancing the image so that it is easier to see what you are looking at. In person, most daguerreotypes, ambrotypes, CDVs and tintypes are quite tiny (2.5” x 4” or smaller), and tintypes in particular can be very dark and hard to see with the naked eye. If you attend one of these shows, bring a magnifying glass.